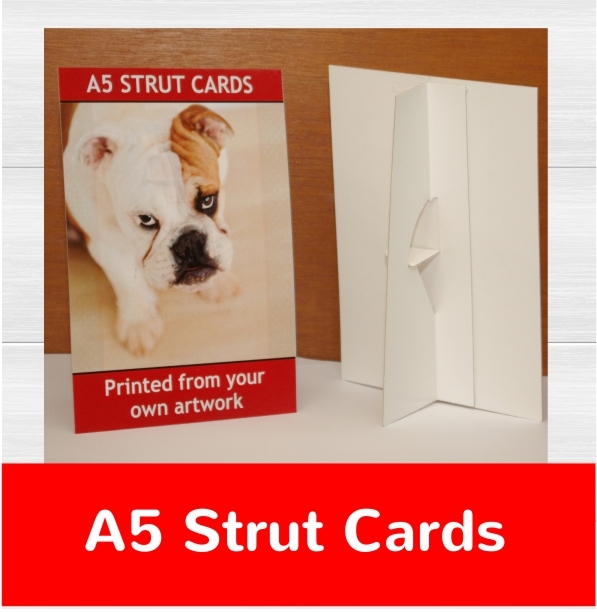 Strut cards or show cards are a perfect solution for point of sale displays, stalls, craft fairs or counter displays. These low cost self-standing A5 boards are printed in full colour and mounted to thick cardboard with a white backing and a matching white rudder strut attached to the reverse ready to use. Simply fold out the strut and set up your display board. Why not select the matt lamination option to enhance and protect your strut card. If you require larger quantities than we have advertised please email your requirements and we will be happy to send you a quotation. How would you like your A5 Strut Card?